I can't believe this week is at an end, I just don't know where the days have gone. On Thursday I spent a lovely afternoon crafting with friends. There should have been 5 of us but in the end we were 3. We had a good gossip made a lovely card, drank tea and ate home made ginger fairings. What could be better. This is the table ready for us to start and on the windowsill a display of new products and makes. Today I have a second card with the same colour combo as yesterday. I have used the bright blossoms stamp set. Its a good set to use with the stamp-a-ma-jig, this is a piece of kit that enables you to place images with precision. It takes some practice but is worth the effort. The little flowers with the pearls are punched with the itty bitty punch pack. This has 3 little punches and is so useful. This card was for last weeks colour challenge amongst our wonderful team of Julie's Jems. The colours are Crumb Cake, Early expresso, Midnight muse, and Pool Party. I have used a retired stamp set as it fits my middle sons activities of the moment. He is planning to climb Ben Nevis in the dark later in the year and the following month Kilimanjaro. rather him than me! So life is one big adventure. There is lots of distressing and daubing. I have used the banner blast from SAB to create the bunting. I had forgotten to publish the makes from training 2 weeks ago. The box is the model for my 'bunny boxes'. Its simple and easy to make but very effective. It could be altered for wedding favours, christenings or birthdays. 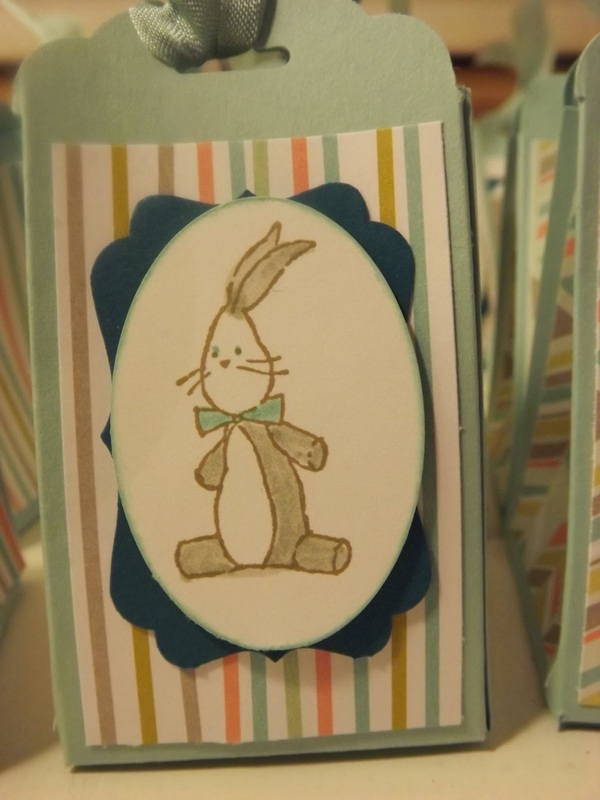 The card using the tag punch on each side allows for the use of ribbon to tie each side together. The colours work well with the paper stack in the spring/summer catalogue. Real Red, Crumb Cake and PoolParty. 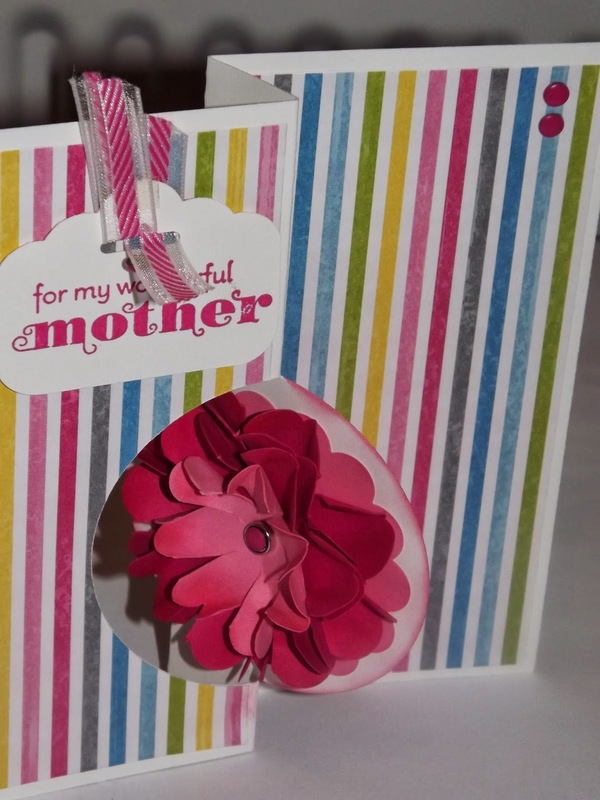 The second card is a very simple card using a tag as the focal point. 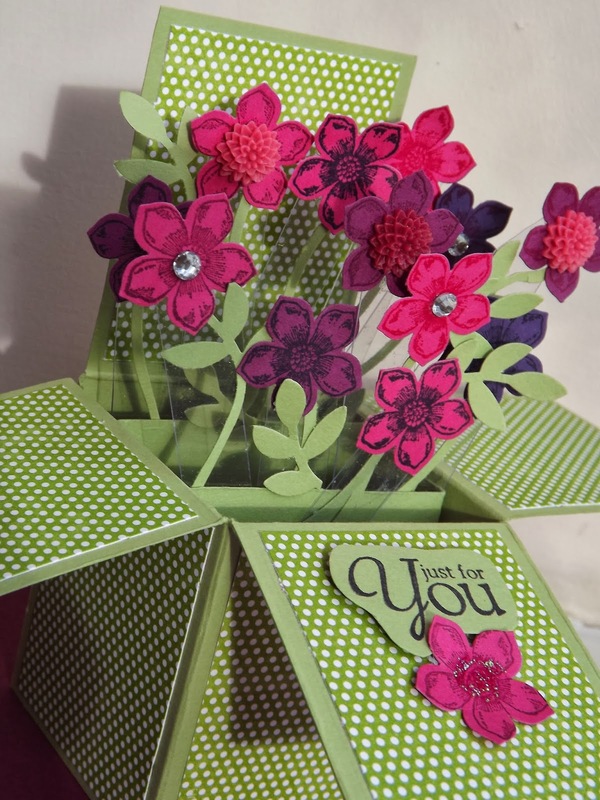 Next week I will have a post using the tag punch to make a concertina card. So this punch is a very useful piece of kit. These two cards are also made with the thinlits die. 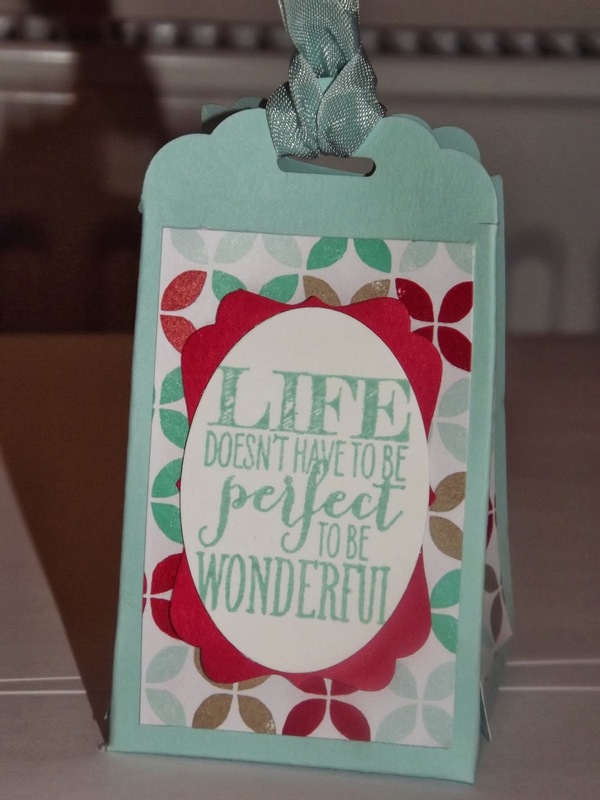 One is made into an easel card and the second one a gift card holder. I really enjoyed making the easel card. I went back to some DSP from a few years ago and this summers petite petals stamps and punch. I added a few pearls and the lace. Another pretty one. And the second one I have kept very simple. I have cut one of the flaps off and attached a layer to put a gift card in. You were warned its flip card week. This card uses the same thinlits as the previous two cards, but I have extended the card by lifting it above the cutting part. This card is very stable and gives more room for a message. A masculine card. I have used the papers from the spring/summer catalogue. The fish from 'By the Tide' stamp set have been coloured with the marker pens. This whole card fits inside a standard C6 envelope. And this is similar to yesterdays but I have reversed the folds so the flip is in the lower half. The flower is made with 3 scallop punched circles, snipped and curled. The centre of the flower uses a brad and the dots which match the card. They are really cute. I have used the tag punch to make the sentiment label and another dot to hold the ribbon in place. Well its going to be 'Flip Card' week. I firstly want to thank Sarah-Jane Rae at cardsandacuppa.blogspot.co.uk for the inspiration. The five cards use the new thinlets. The packs these dies come in have lots more than the main die. The round set that I have used contain 10 dies. Definitely value for money. The first one is very simple using the die as its meant to be used. 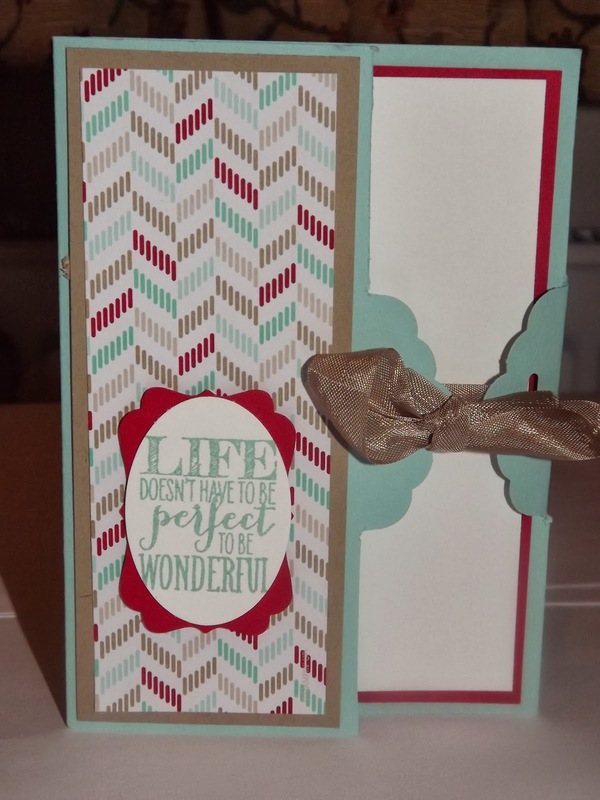 The arrows along the bottom are made with the new Chevron punch. In the Spring/Summer catalogue is a new die. It creates the most amazing roses or flowers. I have a party next week with 8 very experienced crafters so I thought I would come up with something different. This is all on a jam jar lid, 3 flowers, a doily, 3 circles of DSP and some matching ribbon. I think it would look stunning on a jar of home made jam as a gift. Its marmalade making time. Think what it would look like in Tangerine tango............. watch this space! 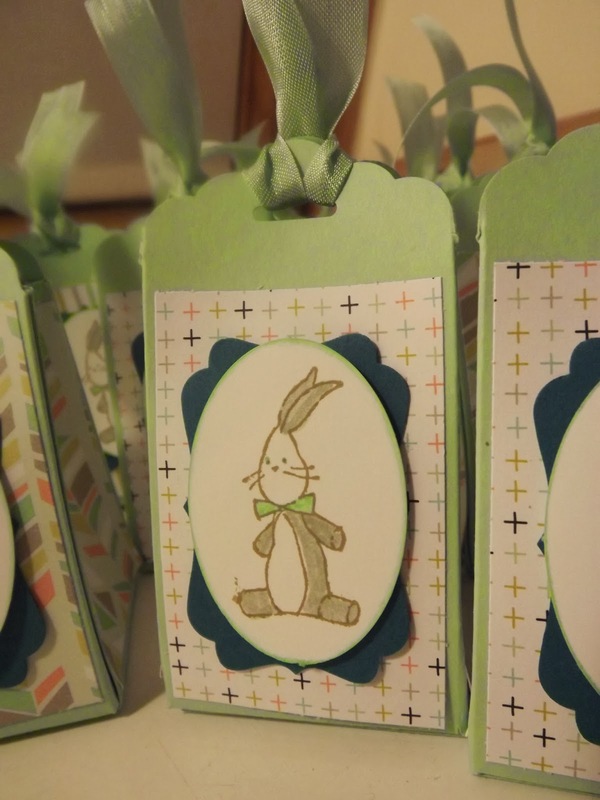 At a crafty party it was spotted and I was asked to make 30 for a baby shower..
For the boxes you use a sheet of card 8 1/2" by 5" and score at 2, 4, 6, 8" along the long side them 2"along the short side. Use the new scalloped top tag punch on two off the sides. Cut the slim part off to the score line and angle out above the score line as per picture. Cut up each score line to the 2" mark. I like to cut a small slit, it helps to ensure enough room when sticking down. Put sticky strip on the thin overlap/ Lay box flat and fold to stick this down. Fold in the bottom squares glue each square as you go. Take the four corners and squeeze the front to the back. Thread ribbon through the tag holes. I have used the SAB papers and the rabbit is from the new "baby, We've grown' stamp set in the Spring/Summer catalogue. The main colour of the boxes and the ribbon is pool party. This is a quick post today with bonus pictures. Using two colours like yesterday but loads of bling and some ribbon. The ribbon is part of the 'in colours' collection. Doesn't the bling sparkle. Stampin'Up! rhinestones are brilliant cut! and only£4.50 for 150 stones. Get in touch if you would like some bling in your life. 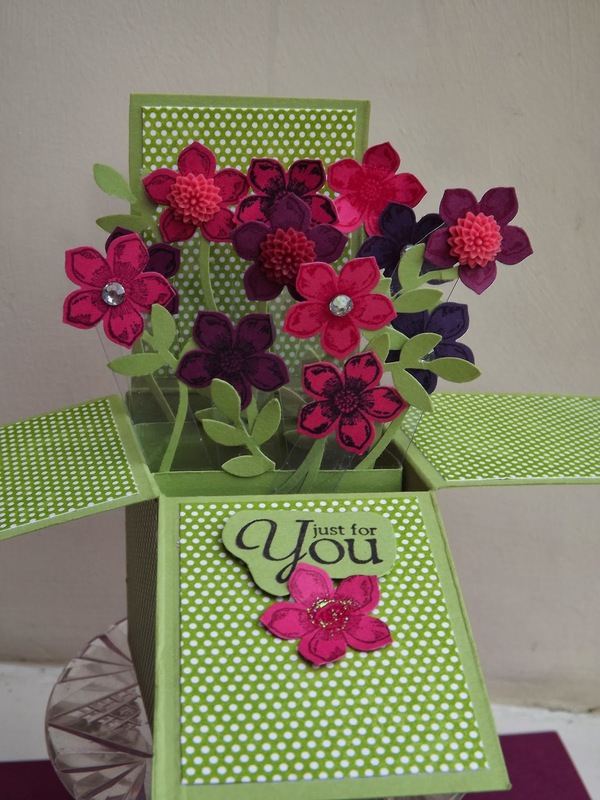 Another Petite Petals card. This one was made at a party last Friday. All the people there were new to crafting. Everyone was successful. Its such an easy stamp set to use. Working in two colours of ink makes the card simpler but effective. The sentiment is from a two stamp set 'Million and one', which includes the 'Million and one thanks' that I posted earlier in the week. I have used colours form this years 'in colours' as they go together so well. This card is stamped with coastal cabana and crisp cantaloup. I could organise a workshop or party for you to try out all these crafting resources. Petite Petals again. This stamp set and matching punch is so easy to use. These are 2 of the Thank You cards I have made for customers in my Stampers 6 club. 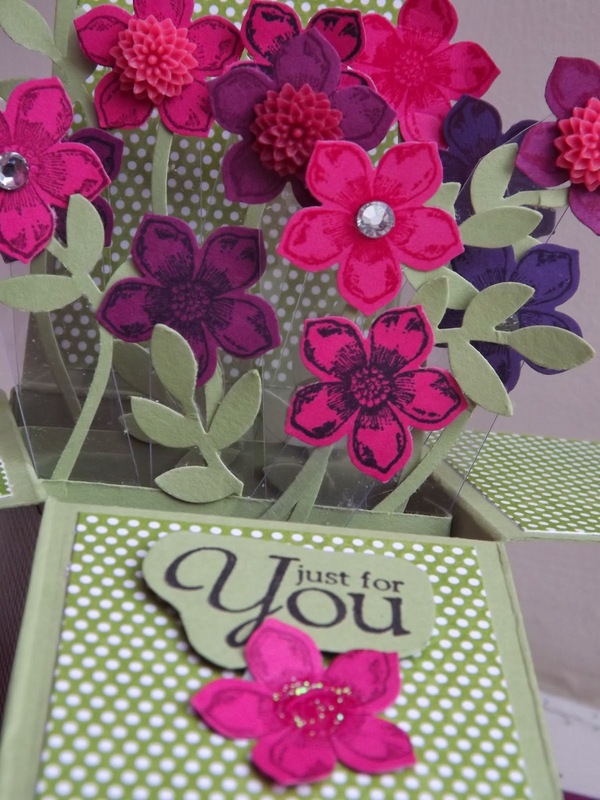 Stamping the sentiment then the flowers around it flat, then adding punched flowers to give the 3d effect. I have used 3 ink colours for the flowers. They liked them I hope you do to. Here they are again, reckon these are going to be my best seller. In March I am running a 'One Sheet Wonder' workshop. We will create with the petite petals stamps a background sheet. Using this sheet we will create 5 beautiful cards that fit neatly into a tin which we will also decorate. Included in the cost of the workshop will be the stamps, the punch, the tin and 5 Stampin'Up! cards and envelopes, plus all the other materials to make the 5 lovely cards. What a lovely time I have had making this card. I have used pear pizzaz for the box base, a colour I don't use very often. I went through my DSP and found the green to match. I kept the flowers simple, only using one of the stamps. In some of the centres I have added embellishments. The card folds flat and fits in a standard envelope. This is a kit in the new Stampin'Up! spring/summer catalogue. It tok me one evening to put together. You could make your own. All you have to add is glue.